Today I had the opportunity to present a topic extremely near to my heart to the head of Special Education for Fresno Unified School District. Fresno Unified is the 4th largest school district in California. There are about 75,000 students in the district, with approximately 10% of them being students with special needs. So much needs to happen to change the narrative of special education within Fresno Unified, and I need to be part of the solution. Special education needs the same kind of collective commitment given to issues of other civil rights. noun 1.a spoken or written account of connected events; a story. I want to change the story that is told about children with special needs. Instead of "different, separate, disabled", I tell a tale of "same, belonging, unique". Same group of individuals, but two incredibly different stories- it's simply a matter of perspective. I want to live in a world where everyone matters. My son is educated in an old portable classroom about 100 yards away from the actual school. There are no general education students also educated all day in these portables. Special education students cannot be segregated, and I must speak up for my boys, and for every child that can't say, "please, make sure I belong." My two amazing boys with autism changed what 'special needs' means to me. They have opened my eyes to the strength, tenacity and spirit it takes to navigate a world that doesn't always make sense to them. They remind me how unique they are, and they broaden my perspective of the entire world and the people in it. They show me that we are also the same, my little buddies and me. We want to be successful. We need to feel valued for who we truly are, and we need to feel like we belong to a community. Belong....I say it out loud and it sounds like music to me. We all need to belong to something that is bigger than we are alone. Inclusion is educating special education students to the maximum extent possible, in age-appropriate general education classes with high quality instruction, and interventions and supports so all students can be successful. Inclusion is more than a set of strategies or practices though. It is an educational orientation that embraces differences, and values the uniqueness each learner brings to the classroom. •The benefits of inclusion for students with and without disabilities have been well researched and well documented. •Inclusion leads to lower rates of suspension and drop out, and to higher rates of employment. •A school’s job is to prepare ALL students for the real world, and the real world doesn’t have separate neighborhoods, jobs and communities for those with special needs. •It's a civil right, protected by Federal law, and the socially just thing to do. Individuals with Disabilities Education Act (IDEA) states that children with disabilities must be educated in the "Least Restrictive Environment" (LRE), and to the maximum extent educated with children who are nondisabled. Fresno Unified school district needs to have a shared vision on what inclusion is, and what it will accomplish for all students. Educators and parents will work harder to accomplish goals when they are stakeholders in the process. Schools or entire districts can create an Inclusion Team Task Force. Educators and stakeholders from multiple disciplines responsible for creating a foundation and implementing meaningful inclusion. Anyone with insight into special education could be take part, including but not limited to general and special education teachers, Speech Therapist, Inclusion Specialist, school principal and parents. Ideally, the task force would be comprised of professionals in the public and private sector in order to increase the range of experiences in the collaboration and to ensure fidelity. An Inclusion Team Task Force could create a framework of inclusion policies and procedures that can be individualized per student. A shared vision, and working policies will also give students more consistency with inclusion from year to year, regardless of their special education or general education teacher. The kids who aren't able to follow common core at the general education pace- the ones who aren't labeled as having "high functioning autism" are getting lost in the system. Amazing and bright children like my son, Greyson. Some have had no exposure to general education classrooms for up to four years. We need to do better to make sure these children are general education students first, and to ensure that practices like "Least Restrictive Environment" under the Individuals with Disabilities Education Act is being followed. Because right now- it is not. • Universal Design for Learning (UDL). This is a proven and effective framework that guides the development of flexible learning environments that accommodate individual learning differences which increases access to learning by accommodating ALL learners. This training should be mandatory and the teachers should be paid for their time. General education teachers themselves have reported that they lack adequate preparation to teach children with moderate to severe disabilities in inclusive settings. When teachers do not receive adequate information, both teacher and students fail. Inclusion doesn't occur by osmosis- It is more than a student sitting in a general education classroom for a set period of time. Proper planning is imperative for meaningful inclusion. Special education and general education teachers need time to collaborate to create adapted curriculum when necessary. The special education educator would take the lead in adapting and modifying, but it's imperative both educators feel ownership in the child's education. Teachers must be compensated for the additional work load extensive planning creates. Inclusion is not just a special education term- it’s a term for ALL students. The entire District, including key administrators and all school sites must treat special education students as equal and valuable members of the school community, in both words and in actions. Right now the Fresno Unified special education website says, "Each child in public school in California is a general education student first". But those are only words. It's not true in action. Special education students should be invited to participate in clubs, they should be a part of all school events, and they should be invited on the same field trips at the same time as their general education peers. Special education students should eat lunch with their general education peers. The special education classrooms should be integrated within the heart of each site campus. This is imperative because it disallows segregation and it allows faster and easier transitions between classrooms. The entire school should be adapted to be inclusion friendly. Just as schools would use brail for students who are blind, children with autism need visual supports and sensory tools in all common areas including but not limited to the library, playground, bathrooms, cafeteria, motor and resource rooms. “Positive attitudes, strong partnerships between parents and educators, use of appropriate interventions to address students’ needs, and meaningful adaptations and modifications to the curriculum are considered important elements for inclusive programs to be effective”. Successful implementation of inclusion requires commitment, creative thinking, a growth mindset and effective classroom strategies. At the beginning of every year, every eligible special education student should be assigned a general education teacher, and a desk in the classroom so they aren't visitors. Inclusion is about interaction and imitation. A time when a child should be coached to follow a sequence of behaviors in situations that are academically relevant. The child with disabilities needs to be given opportunities to participate in the lesson and interact with peers in ANY area where they may possess skills that are on target with their general education peers. It's important that the inclusion opportunities are in line with a special education student’s skills in order to be successful. Not doing inclusion is bad. But doing bad inclusion is worse. Inclusion should be evidence based, while using a variety of differentiated learning techniques (Modeling, Naturalistic Intervention and Peer Mediated Instruction Programs). The classroom environment is an important factor in inclusion. There should be clear, designated areas for instruction with developmentally appropriate center names. There should be numerous visual supports throughout the classroom and any shared environments. All students will benefit from a classroom schedule and visual timers to indicate transitions. The US Department of Education recommends Co-teaching as an effective tool to use in the inclusive classroom. This is a teaching relationship in which general and special educators share responsibility for planning, delivery and evaluation of instruction for a heterogeneous group of students. These teachers use techniques which allow students of varying abilities to achieve their potential. The program utilizes behavioral strategies such as: schedules, fluency-based practice, generalization scenarios, peer-based modeling, video modeling and scripting to help develop skills in multiple areas. Here are some results of research done at schools in Southern California. The data looks at students with autism who would have formerly all been excluded to separate special education schools, but were now randomized to either an inclusion classroom, or a special education only classroom. All special education teachers co-taught with general education teachers in the inclusion setting. The graph shows the average change in standard scores between initial and subsequent administrations of the Woodcock-Johnson achievement tests between first and sixth grade, and examined reading, math and writing. 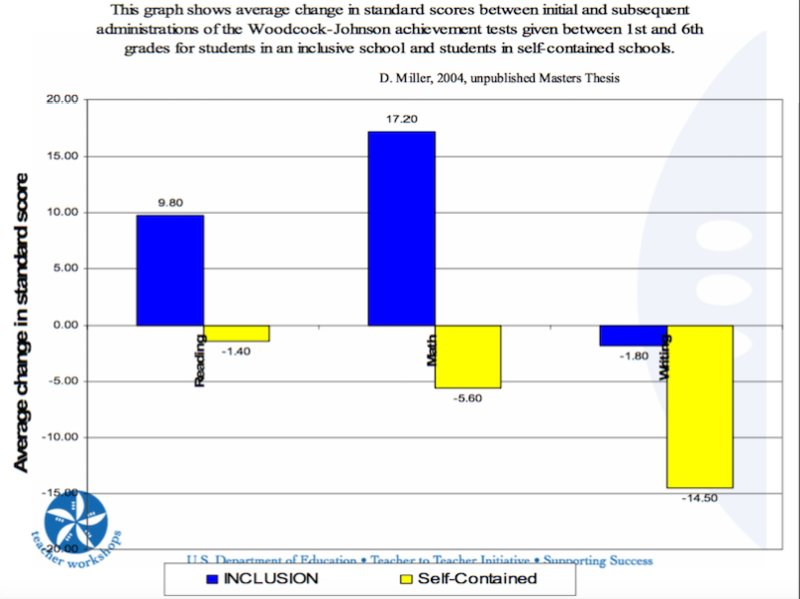 The Special education students in an inclusive school results are shown in blue, and special education students in self-contained schools are in yellow. As you can see by the graph, the increase in standard scores for reading and math were tremendous for the special education students that were in an inclusive classroom. Students who remained in segregated schools not only did not improve, they got worse. When it comes to inclusion, there is no one size fits all. Full time inclusion is not academically appropriate for all children with disabilities. My second grade son with autism needs to also spend time in a small classroom, free of too much sensory stimulation with one on one instruction. There are numerous things he needs to learn in much smaller steps than what is being taught in second grade common core. It's key that inclusion is as individual as an IEP. And for children that cannot leave their classroom, or to create social and language opportunities for every student in special education, reverse inclusion is an effective intervention tool that involves bringing several general education students out of their classrooms for short periods of time to interact socially with students with disabilities in their self-contained classrooms. These interaction opportunities are provided when the students are involved in a wide range of activities conducted in various settings. Program success depends on: 1) proper recruitment and preparation of students for the program; 2) effective scheduling of interactions; 3) identification and selection of appropriate activities; and 4) the development of measurable program goals. 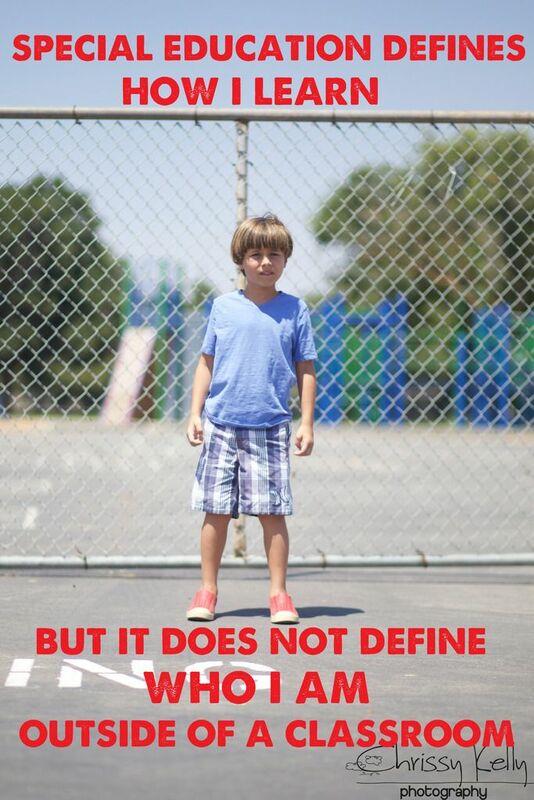 At the end of the day, what is important in Special Education is what is also what is important to ALL children. Special Education students need to be given access to the tools they need to learn. They need to be evaluated and taught based on how they learn, and what makes them tick. When they aren't getting it, we don't quit and say- "Well, we tried." We say, "What other way can I teach this same concept based on what this learner needs?" Most importantly, students with special needs must know they are a valuable part of their school, and they need to feel like they belong. In order to feel like they belong, they need to be treated like they do. So, let's work together and build something great for these children. Powerful and so well said. I emailed it to my best friend who has her doctorate in Special Education... they call her the Autism Whisperer. She is an assistant prof at West Chester University in West Chester, PA. Her students need to read your latest post and the one your wrote to Betsy DeVos. Well done, Chrissy. High fivin' you from N.C. Thank you for being the voice for all of us! is supposed to teach students how to think from different perspectives so I try very hard to plan my lessons from that mindset. I used to work in a segregated special day class apart from the rest of the school. The children in my classroom knew that they were not part of the school and that they were not welcome to on and off-campus events. The parents knew too. It was awful. My heart hurt for the kids and parents everyday in that environment. As an educator, I felt isolated and excluded too. It was negative for everyone on both sides of the issue. I would NEVER teach in a classroom like that again. In order to grow as a society, we need inclusion of all people and perspectives. We are missing out on many opportunities for growth with our current policies and attitudes towards people who have "disabilities". Thank you so much for sharing. I adore your perspective and am so happy to know people like you and your husband exist! You are a wonderful advocate! I almost agree every part of you said in here for the special education for the children. You really do a great job in order to start such step. I think people will support you in such step in the Public Schools in Fresno. Best wishes for your next step.